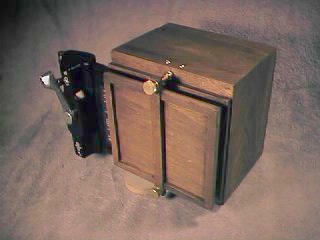 This is a pretty standard box-type pinhole camera. It uses a fixed-focal length configuration and has an effective aperture of f 263. There is no fancy shuuter required, the leather 'lens' cap serves that function as well. The camera uses standard 4x5 film holders that can be purchased at any decent used camera store. Front view with leather 'lens' cap. 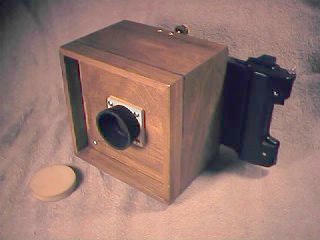 The camera is constructed from mahogany-stained basswood and assorted hardwoods. The pinhole is drilled in .001 " brass shim stock. The excess brass was removed with 600 grit sandpaper. The inside of the camera is painted with Darkroom Paint....ultra-flat black. This was a simple camera project that took only a few evenings to complete. Rear view with 4 x 5 Polaroid back. 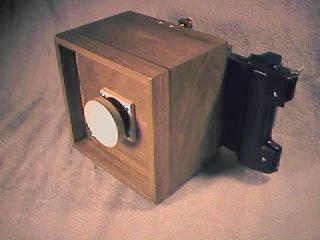 This camera is used with a 4 x 5 Polaroid back which provides instant feedback to check exposure times. Though a new Polaroid back is worth far more than the camera, this unit was purchased very reasonably at a local used camera store. This setup makes this camera a joy to use.